At least one of us got to enjoy the holiday weekend. I had to work all weekend, but J met her parents down near Sturgis and spent the weekend on the lake. Before that, she wanted to go out to breakfast. Once again, I got up way before I normally do so we could enjoy breakfast together. I thought our plan was to go to breakfast then to the Kalamazoo Farmer’s Market, so I was looking for a downtown choice for breakfast. First thing that came to my mind was Theo & Stacy’s. The South Westnedge location is closer to home, but the downtown location is closer to the market. 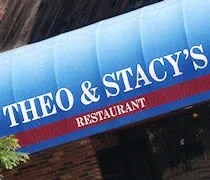 Theo & Stacy’s has three area locations. The downtown location is on Michigan Avenue near Rose Street. Parking is all street parking in this area and it wasn’t too hard to find a spot on a Saturday morning. The restaurant is pretty tiny. It’s one large room with booths on either side and tables filling up the rest of the space. We were told to grab a table anywhere, so we picked a booth near the back. The menus were already on the table so we were already looking them over when the waitress came to get drinks. Even though it was breakfast, we both went with Coke’s which were served in tiny glasses that were barely two drinks. I chugged my first glass and waited patiently for another while we decided on what to eat. It was almost 11:00 by the time we actually made it to breakfast, but they didn’t have the lunch menus out yet so we just went with breakfast. The menu is pretty much all numbered combos. Nothing fancy. Just straight up diner breakfast. 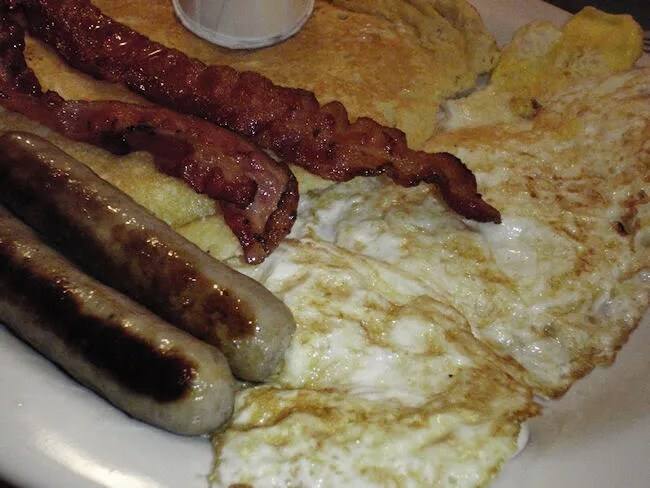 I went with the option that included two eggs, bacon, sausage, and a pancake. I was given the option of regular or sugar free syrup. I just went with regular. I got the eggs over hard, but they were still pretty runny. I actually like them that way, so I didn’t complain. I never know how to order eggs. For being a food guy, I’m completely oblivious to diner speak for eggs. Everything else on my plate was pretty good. Again, quality diner food, but nothing extraordinary. J’s meal included eggs, bacon, American fries, and toast. She got her eggs scrambled which is a much simpler way of ordering them. She seemed to like everything on her plate, but again, quality food, nothing extraordinary. 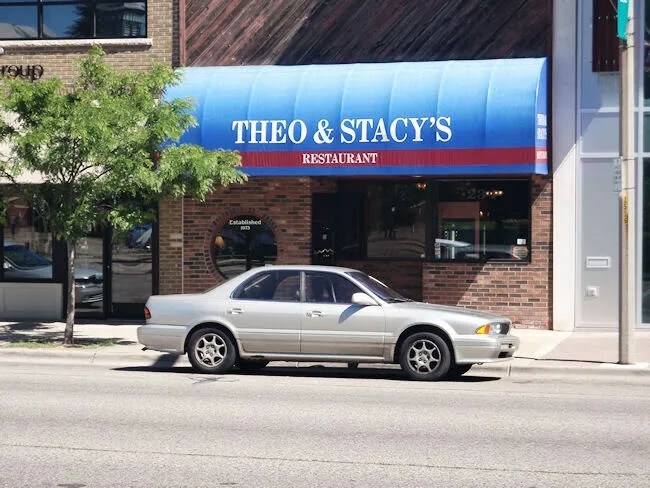 The great thing about Theo & Stacy’s was the speed of service. It was really only a few minutes after we ordered that we got our food. I saw the waitress coming out with two plates and didn’t think it would actually be ours. On top of that, it was fairly cheap. We got both meals for just a little over $13. 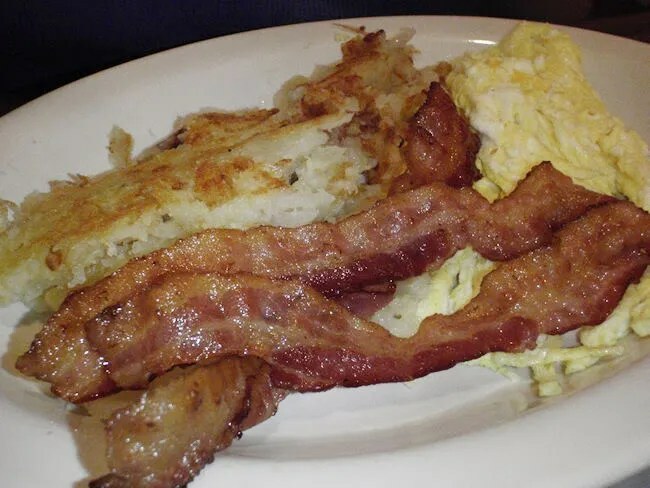 As a breakfast joint, Theo & Stacy’s does the easy things well. They get you in and out which is really what you’re looking for in a place like this. It reminds me of the places back home where the farmer’s would gather in the morning for coffee and gossip before hitting the fields. Don’t expect anything unique or out of the ordinary, but you can be assured that you will get a quick breakfast pretty cheaply.